Before that “weekend feeling” really takes hold, many Germans must first head over to discount stores, supermarkets and drugstores to quickly pick up some bread, cheese and fresh vegetables, return their plastic bottles and stock up on toiletries. Around one in three Germans see this as quite an inconvenience. This is perhaps due to the fact many consumers have to use their Saturday for these tasks. More than a fifth of fast moving consumer good (FMCG) sales are still generated on this day. For an increasing number of Germans, shopping represents a slightly irksome duty rather than a pleasant experience. Last year, 34% of German household heads expressed the view that going shopping at supermarkets and discount stores, among others, was an inconvenience. In 2006, this figure was just 26%. 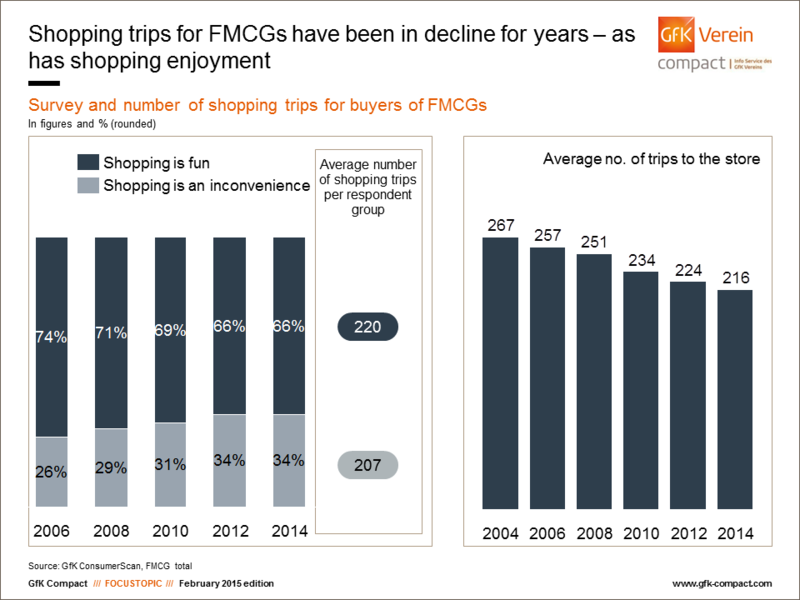 At the same time, the number of shopping trips for FMCGs has been dwindling for years. Germans went to the store an average of 267 times in 2004. By 2014, this had fallen to 216. These are results of the GfK Consumer Scan household panel, which continuously collects data on the shopping behavior of approximately 30,000 German households. Weekends are often the only time for working people to stock up their pantries. This is also a likely reason for the increase in those who find doing a weekly shop a bothersome task. 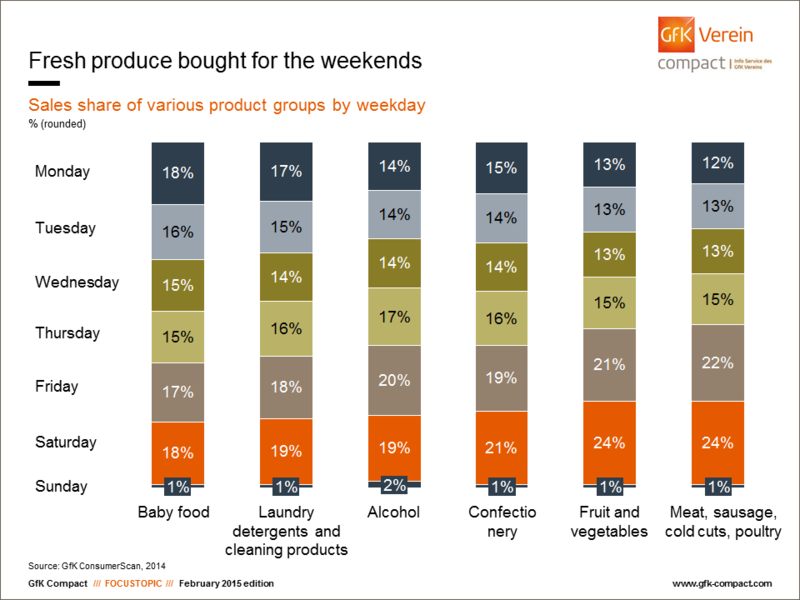 There is a clear growing trend for Germans having (no choice but) to use their weekend for buying groceries. In this respect, Saturdays have cemented their place as a shopping day even more since 2010. Special weekend offers promoted by some discount stores (“Super Saturday” or Penny supermarket’s own “Framstag” initiative) play an important role. Profits for this day come above all at the expense of Thursday and Friday. The values for these days each decreased by around one percentage point. The start of the week ranks lowly, although it is stable against the values recorded in 2010: Mondays and Tuesdays account for 14% and 13% of total FMCG sales, respectively. 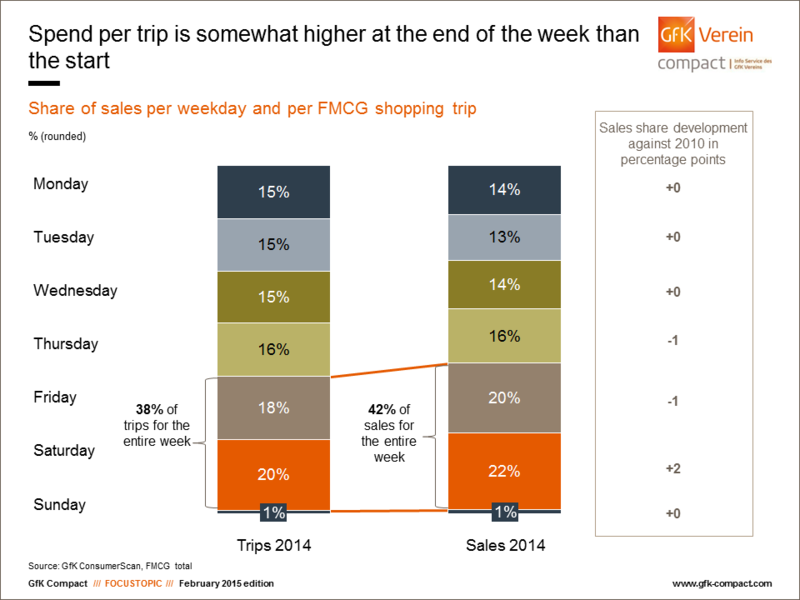 Does the sales proportion reveal anything to do with shopping frequency? Absolutely, as the distribution of sales and shopping trips on the individual days clearly shows. To a large extent, the two values correspond. However, there is a distinct shift towards the weekend. Sales are up for Fridays and Saturdays, with 38% and 42% generated on these last two shopping days of the week. With their working life more than likely behind them, those aged over 60 are not reliant on the weekend. By comparison, they are therefore less likely to go shopping then. For the older generation, Saturdays account for just 19% or 18% of sales. This figure is 22% for younger consumers. The 60 plus age group tends to more regularly use Thursdays to cross off items on their shopping lists. This could perhaps be because supermarket shelves are freshly stocked with new produce on this day. Or maybe they just prefer to be well-prepared heading into the weekend. An added bonus is avoiding overflowing parking lots and long queues at the tills. The middle-aged generation is most likely to shop on Saturdays. The youngest consumer group under the age of 30 also stocks up on Saturdays, but interestingly they will also shop on Mondays more often than others. Differences become apparent when examining individual sales channels. We note that sales of drug store products are often well above average at the start of the week, with 18% of sales being made on a Monday. 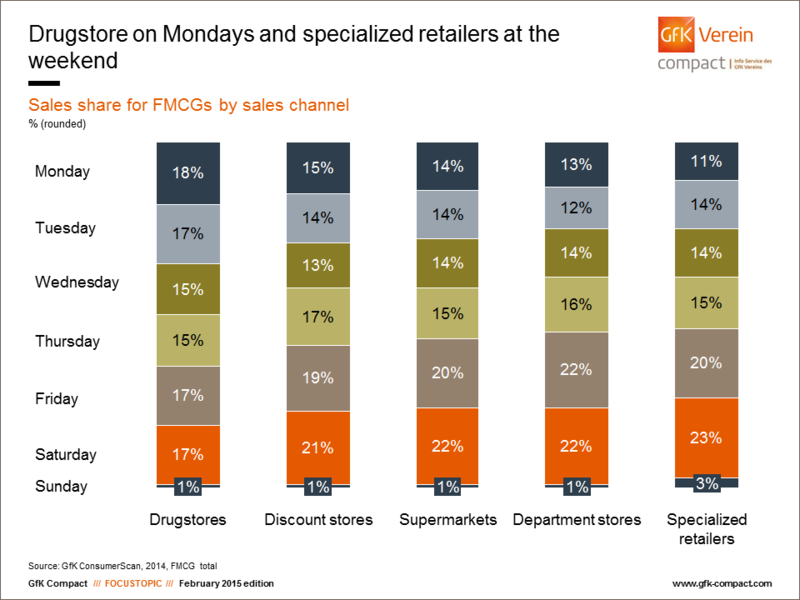 At 17%, the proportion of sales in drugstores on Saturdays is significantly behind the values for other sales channels. Specialized retailers, which also includes bakeries, tend to do disproportionally well on Sundays in Germany. Sundays are the weakest sales day of the week across all sales channels, but specialized retailers still manage to generate 3% of their sales on this day. The amount of money spent on FMCGs on any given day is not just dependent on the various sales channels, but also the product category. Germans buy fruit and vegetables, together with meat, sausages, cold cuts and poultry with one eye on the weekend’s menu. From Thursday onward, sales in these categories increase markedly. By Saturday, the share has reached 24% for meat, sausages and cold cuts and for fruit and vegetables. By contrast, these values are a good 11 or 12 percentage points lower on Mondays. Sales of confectionery and alcohol also increase over the course of the week, with a notable peak already evident for Thursday. This means that Saturday is not as significant for purchases of alcohol and confectionery as it is for meat, fruit and vegetables. Nevertheless, Germans are keen to treat themselves to a glass or two of wine or a couple of beers with their homemade meal at the weekend. The picture is a little different for household cleaning products and laundry detergents. Mondays are relatively popular for this segment, with 17% of sales occurring at the start of the week. It is perhaps quite common that consumers need to replenish supplies after a particularly thorough weekend clean. For the baby food segment, sales are spread quite evenly over the whole week. This could be because young parents either do not work or only work part time in the week, meaning they have less need to head out on Saturdays for their weekly shop. Those who don’t have much spare time or wish to use their Saturday to go food shopping need not to stress too much. Even if they fail to get to the store before it closes, there is always something hiding away in the back of the refrigerator or pantry. Then it’s simply a case of switching on the laptop to search for inspiration online. Handy hints, tips and recipes to use up leftover ingredients are available on many different websites. The Federal Ministry for Food and Agriculture has developed an app called “too good for the bin”. This offers culinary ideas presented by well-known figures which can be prepared using a few simple ingredients. So there is nothing standing in the way of a relaxing Sunday. If you have any queries please contact Claudia Gaspar (claudia.gaspar@gfk-verein.org).